It is important for students to understand their responsibility in appropriate use of cell phones. 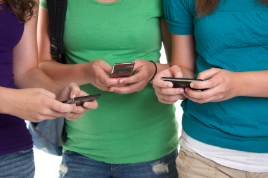 School officials will continue to monitor abuse of cell phones as it relates to cyber-bullying, harassment issues by students, academic cheating, and inappropriate use of picture cell phones in violation of students’ right to privacy. The following use of cell phones will be permitted during the regular school day (8:00 – 3:30). 1st Offense will result in the cell phone being taken by a staff member, turned in to the assistant principal’s office and returned only to a parent/guardian at the end of the school day. 2nd offense will result in ISS (In School Suspension) time determined by school administration. 3rd Offense will result in placement in the “Choices Program” for a period determined by school administration. The Information and Attendance Center has a telephone available to students.Messages for students will be taken only from a parent/guardian listed on their emergency card. Students will not be called from class to the telephone except in case of emergency at the request of a parent/guardian.